"A wild concoction of Vonnegut and Lynch filtered through Mel Brooks, this is one rollicking existential ride through the ugly '80s world of Hollywood and publishing, and I've never read anything like it. Screwball and cosmic horror collide in Pivovarnick's absurd genre-bender that feels like watching Angel Heart and After Hours on a handful of psychoactives." -Thomas Pluck, author of Bad Boy Boogie and Life During Wartime It's 1984 in Los Angeles. 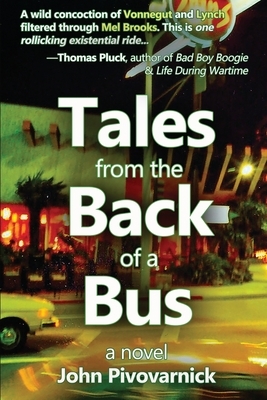 Jake Maldemer's first book, Tales from the Back of a Bus, is a hit. It's a darkly comic genre-bending roman clef in which aspiring writer 'Jack Moses' meets an odd little man name Kobold who keeps randomly feeding him, handwritten horror stories as they travel across Los Angeles in the back of an RTD bus. Just as the life of Jake's storybook-self gets stranger and more chaotic, so does Jake's real life. As he heads across the country to start his first ever book tour, stories and messages begin to arrive from someone calling themselves Kobold out here in the real world. Either somebody is playing an amazingly cruel and elaborate joke on him, or Jake Maldemer is slowly going insane.